The Manistee Art Institute is pleased to announce the recipients of its 2010 Deb Guenther Memorial Art Scholarship — Kailani Buckner, Onekama High School, and Thomas Bond, Manistee High School. Kailani is the daughter of Scott and Kathy Buckner of Onekama and will graduate this year with a perfect 4.0 grade point average. She plans to attend the University of Michigan in the Fall and major in film studies and graphic design. In addition to academic excellence, Kailani has been a very active student at OHS, serving as president of the National Honor Society, co-editor of the yearbook, class secretary, and team captain of the Onekama Quiz Bowl team. In addition, throughout high school she has been an active member of the volleyball, softball, and basketball teams as well as track and field. Outside of school, Kailani has been a consistent volunteer for community blood drives, Toys for Tots, the local food pantry and the Humane Society. Thomas Bond is the son of Jim Bond and Ingrid Bond of Manistee. With a 3.98 grade point average, Thomas plans to attend Michigan State University and major in Psychology, an interest that has arisen from his desire to study human behavior as it relates to his experiences with the arts. In high school, Thomas has been an active student, serving as secretary of the National Honor Society and Youth Observer and Representative to the Ramsdell Governing Board, and in his sophomore year was involved in the creation of the Art Garden in downtown Manistee. In addition, he has been a both a junior varsity and varsity member of the baseball teams and played varsity tennis. Throughout high school, he delivered the Manistee News Advocate. 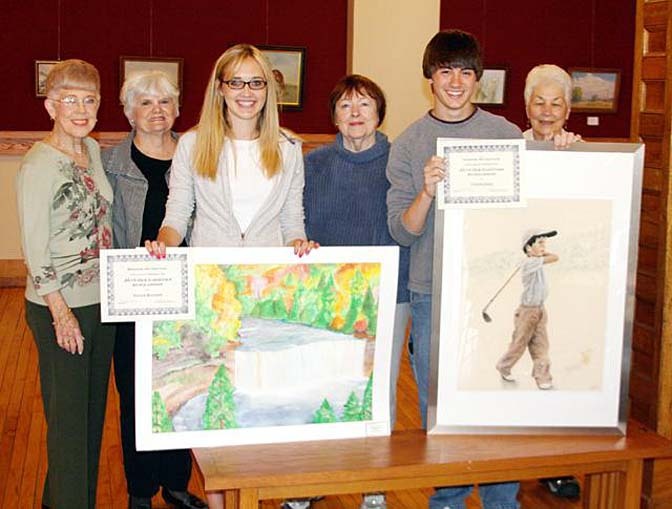 2010 is the fourth year for the awarding of the Deb Guenther Art Scholarship by the Manistee Art Institute. Established in memory of a well-known and beloved local artist who passed away several years, the scholarship is awarded to Manistee County graduating senior(s). Recipients are expected to have had art experience throughout their education but do not have to be pursuing art careers after high school. The MAI is especially grateful to art instructors Dana Woolman, Onekama High School and Monte Klein, Manistee High School for their support of this year’s recipients.